Cliver Barker's malevolent monster The Candyman comes to New Orleans in CANDYMAN : FAREWELL TO THE FLESH (AKA Candyman 2). Bill Condon's 1995 follow up to Bernard Rose's original 1993 shocker, which makes its UK Blu-Ray debut this month in an extras laden disc, courtesy of 88 films. Annie Tarrant (Kelly Rowan - Assassins) is a New Orlean's school teacher, whose brother Ethan (William O'Leary - Terminator 3) has been arrested following the brutal death of a University lecturer, who he had earlier attacked in a bar. It seems the lecturer, Philip Purcell (Michael Culkin reprising his role from the previous film) had been in town promoting his book about the legend of the Candyman. But of course the police don't believe Ethan's story about hook handed killer's appearing from mirror's after saying their name 5 times, and think he's probably the one responsible. 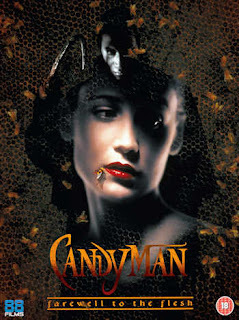 Unfortunately for Annie, the Candyman is all too real and now appears to be after her and the rest of her family. But after doing some digging into his origins, it seems there's a reason he has set his sights on her and a terrible family secret is about to be uncovered. Also starring Veronica Cartwright (Alien, Invasion of the Body Snatchers), Bill Nunn (Spider-Man) and of course horror veteran Tony Todd (Night of the Living Dead 1990, Final Destination) as the Candyman himself. This is a worthy follow up by director Bill Condon (Gods and Monsters) to the original film, which itself was an adaptation of the Clive Barker story "Forbidden", and is an excellent supernatural shocker. -‘Down Memory Lane’ (10mins)- Co-star Veronica Cartwright talks about her time on set and discusses her other horror movie roles. -Original theatrical trailer - lastly, the films theatrical trailer is included. The first print run also comes packaged in a slipcase and includes a collectors' booklet by film journalists Dave Wain and Matty Budrewicz. But these are strictly limited to the first 1500 copies only.